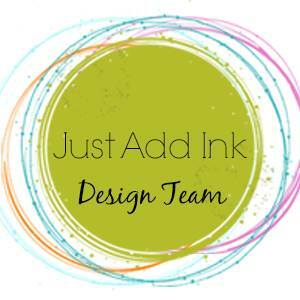 Time for the new Just Add Ink challenge! This week Rachael has found this absolutely gorgeous Inspiration photo to guide our crafting. What a feast for the senses - can you imagine the texture and the scent to go with those glorious colours? So pretty! I went straight for the equally pretty Beautifully Detailed Laser-Cut Specialty Paper for my card. I lightly brayered over the panel I selected for my card with some Bermuda Bay ink to match the card base. It turned out quite patchy with some white areas showing though - exactly as I'd hoped! I then mounted it on a piece of Bermuda Bay Cardstock cut ever so slightly smaller than the panel, and popped the whole piece up on Dimensionals. A few layered pieces on the front and I was done! I tore along the bottom edge of the Mango Melody cardstock for a different look, and then adhered it on top of a length of Melon Mambo cardstock. The DSP underneath is from the Garden Impressions DSP pack. I thought the colours and patterns worked well to represent the vases in the Inspiration photo. I cropped the butterflies on the inside from another sheet of the DSP. I finally caved and purchased the Butterfly Duo punch after I'd fussy cut quite a lot of butterflies! Is your mind turning over what you're going to do with the Inspiration photo? I hope so! It's a great picture, full of lots of elements to draw ideas from. I can't wait to see what you make! 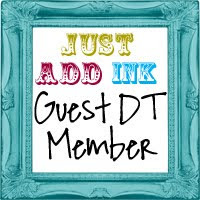 Don't forget to link it up over at the Just Add Ink blog. • If you spend $180, you get one free level 2 product, OR, you can choose two level 1 items.• If you spend $270, you have the option to choose three level 1 items or one level 1 item and one level 2 items. The Sale-A-Bration promotion is current now until March 31st. Be sure to request your copy of the brochure today if you don’t already have one. 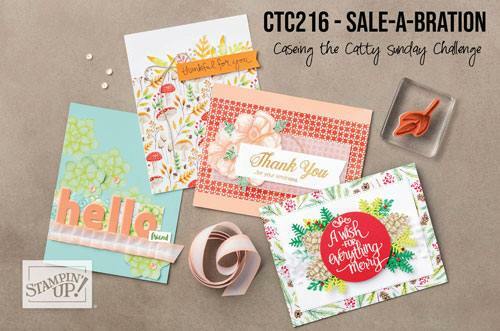 Sale-A-Bration is also a great time to join our fabulous team - just ask any of the girls on the blog hop for more details! Let's get straight into it! I made a card using quite a few Sale-A-Bration items, from both the first and second release brochures. I started with a Lovely Lipstick Foil Sheet, as I haven't really played much with them. You can earn them from the first release brochure, in a pack with Grapefruit Grove Foil sheets. Sitting on the top of my desk was the new Country Floral DTIEF, so I thought, why not? The Foil looks amazing embossed in the floral design. It's so hard to capture in a photograph, as the light bounces off it everywhere! On my base card and a few scraps of Whisper White, I also stamped some leaves from the second release Painted Seasons bundle. The stamp set comes in a bundle with a gorgeous DSP pack, and it can be yours free with a spend of $180. How cute is that little flower? You can see that the shape of it mimics some of the flowers in the Country Floral DTIEF. I've actually used a combination of a wooden flower from the Butterfly Elements (first release) and a retired flower punch. I can't recall the name of the set, but it came with a heart and a star, possibly even a circle in the punch pack. The punch is nearly the same shape as the wooden flower! I used a Sharpie to colour the wood and then glued the punched Lovely Lipstick Foil flower on top. Finally, I added a Basic Black Faceted Dot to finish it off. I had a left over scrap of the embossed foil so, after stamping some more leaves, I added it to the inside. You know me - waste not, want not! That's it for me - did you keep track of how many Sale-A-Bration items I used? Now you're off to see what the lovely Ros Davidson has created. This week for the Colour Creations Blog Share we are looking at another colour that I'm not really fond of - Pineapple Punch. It's just a bit too fluro for me! However, after using it this week I have to concede that it's not too bad after all. I don't actually have a lot of Pineapple Punch stuff, so I decided to see what I could do with some of the cards from my Happiness Blooms Memories and More kit. I made a gift box! The Memories & More card I used was one of the specialty cards that has a glossy design on them. In this case, the flowers are the glossy part. To make the box lid I simply scored each side at 3/4 inch and then cut, folded and glued to make the lid. The base of the box was made in a similar fashion. I did sketch it out in a notebook first to make sure I got all of the dimensions correct. Measure twice, cut once! 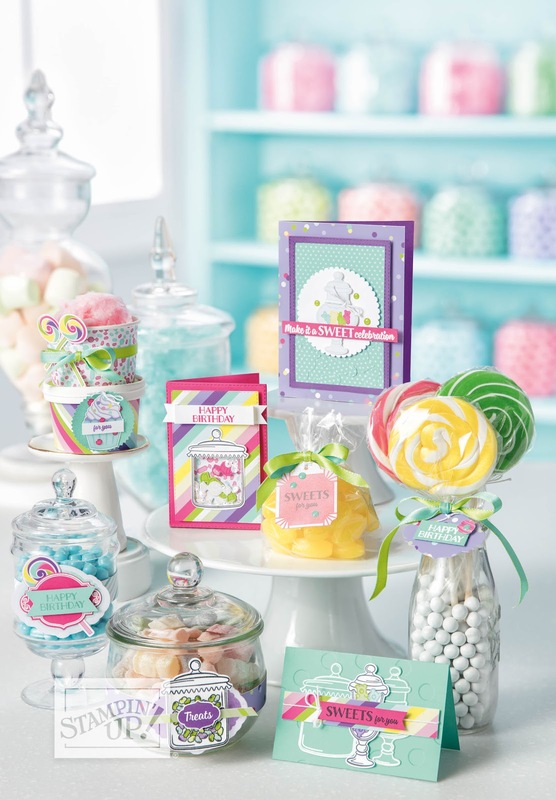 The tag is one of my favourites from the Occasions Catalogue - the Sweet Pins and Tags pack. I coloured the tag using a sponge brayer and Night Of Navy ink and then layered some stickers from the Memories & More pack. The flowers were white, so to turn them Pineapple Punch I simple coloured them with the Dark Pineapple Punch Blend. I used a length of Pineapple Punch 1/8" Grosgrain Ribbon to hold the box closed and to anchor the tag. It didn't stand out very well, so I added a belly band of Night Of Navy underneath. Much better! That's it for me, so why not pop on over to Catherine's blog to see the rest of this week's projects? Oh, wow, where did that week go? They are just flying by right now! 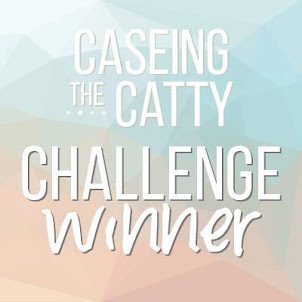 Suddenly it's time for the Sunday night CASEing The Catty Blog Hop. Yay! The blog before mine was my fellow South Aussie and friend, Kathryn. 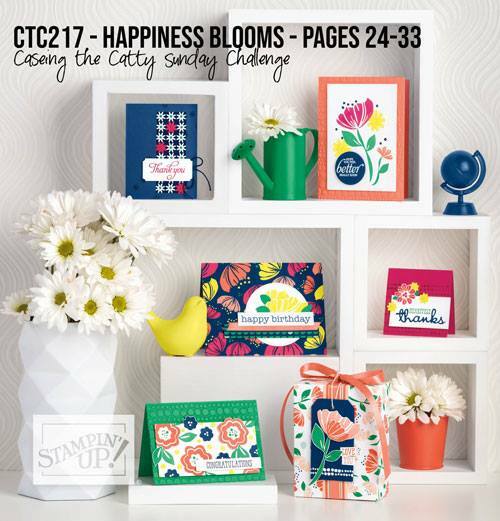 This week we are looking at the Happiness Blooms section of the Occasions Catalogue. It is quite a large section, clocking in at a whopping 9 pages. Plenty of inspiration to be found! My eye was caught by the 'smile' card from page 26, and so that's what I CASEd this week - in particular the colours and the vellum element. I started by stamping the image from Lovely Lattice on Shimmery White cardstock using Stazon ink. I then watercoloured the image using Lovely Lipstick, Pineapple Punch, Call Me Clover and Night Of Navy ink. I'm very much a 'slap on the colour' type of watercolourer - so while I try to get colour variations in each section I'm not really hung up on trying to get the shadows just right. I love the used of vellum for a sentiment where you don't want to cover your image. If you've just spent all that time and effort colouring, why cover it up? Vellum is a great compromise. I stamped on this strip with Stazon and then wrapped it around the main panel, adhering it at the back and solving the problem of needing to hide the adhesive. Sigh, I've tried so hard to get my cards out early this year, but it's late February and I've already had to drag out the 'happy belated birthday' sentiment. Oh well, March is a fresh month to get back on track! It's your turn now - which card inspires you? Do you like the layout, the colours, or maybe a technique? Get creative and share your card over in our Facebook group. 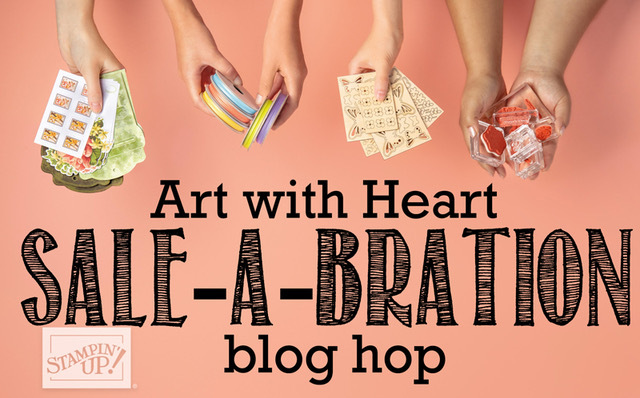 Before you dash off to make your card for this week's challenge, don't forget to complete the Blog Hop! Next is the lovely Monique. Thanks for joining me for the new Just Add Ink Challenge. 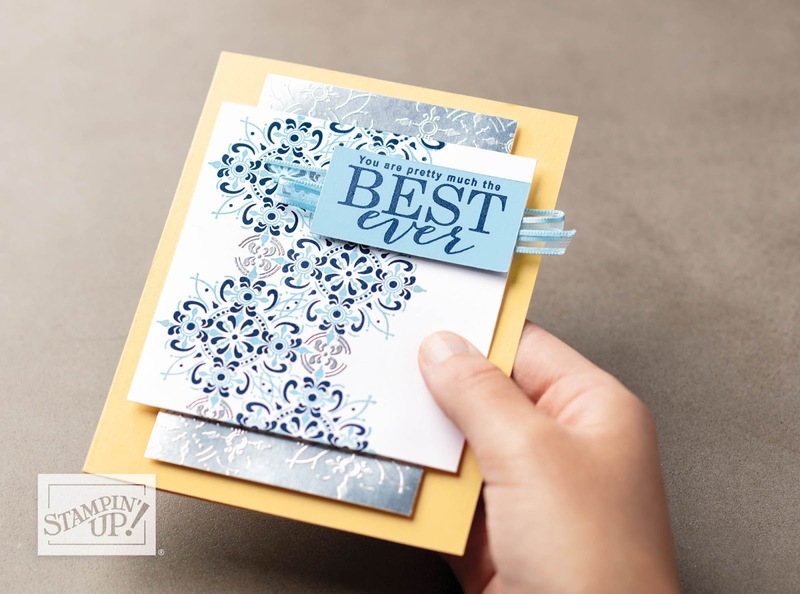 This week Rochelle has challenged us to add embossing to our cards. You can use any type of embossing - heat, dry or even the embossing mats. When planning my card I decided to use heat embossing, but I also ended up using dry embossing too. 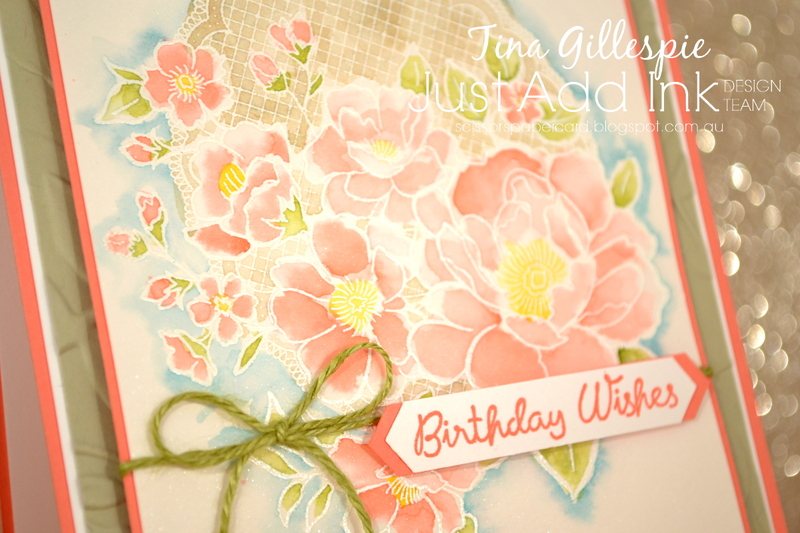 I recently received the Lovely Lattice stamp set as a Sale-A-Bration freebie and I was keen tp try it out. I heat embossed the main image on Shimmery White cardstock using white embossing power. I then watercoloured the image using my ink pads and a pair of Aqua Painters. I used two, as I used the colouring technique where you 'fill' an embossed area with water and then drop a little bit of ink into the water and allow the colour to spread. It's a bit of a cheats way to watercolour. I used Granny Apple Green on the leaves and Flirty Flamingo and Crushed Curry on the flowers. I then used Sahara Sand to colour the lattice and Balmy Blue to outline the image to help it pop. I used two of the smaller flowers on the inside, this tie using the no line watercolouring technique on them. It was my first time trying that technique and I'm definitely going to give it another go soon! That's it for me this week. 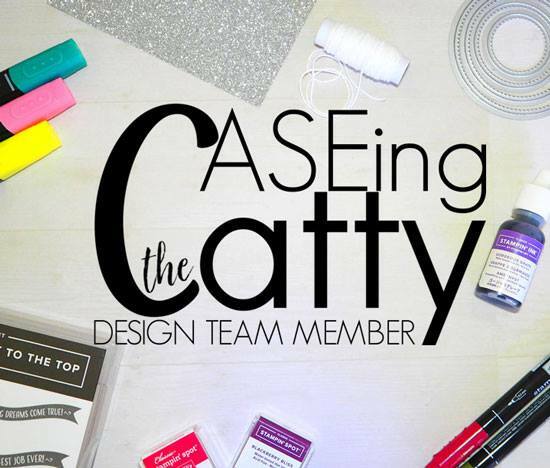 What type - or types - of embossing will you use? 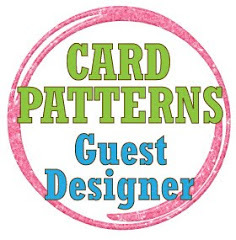 You can see what the Design Team chose over at the Just Add Ink blog, where you can also link up your card. See you there! 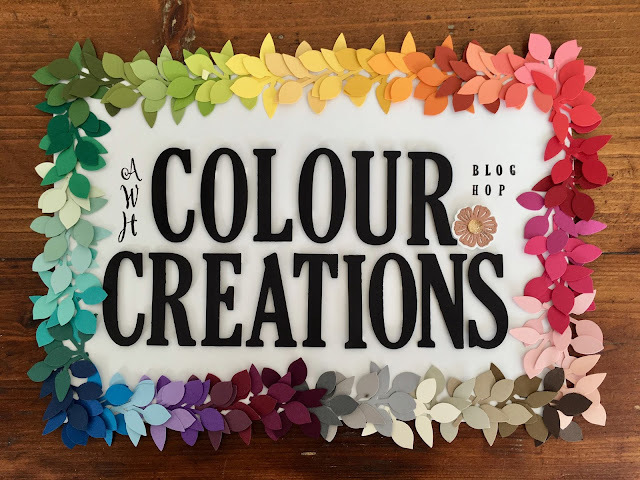 Tuesday night means it's time for the Art With Heart Colour Creations Blog Share. I've lost count of the number we are up to, but we are well past half way, and I'm impressed that I've managed to join in every week so far. Hopefully I haven't jinxed myself by saying that! 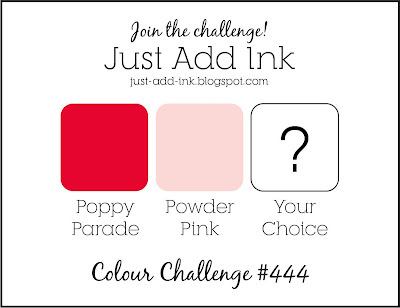 It's Petal Pink this week, which isn't a colour I particularly like. It's a little on the coral/peach side of the pinks and I prefer a pinker pink, if you know what I mean! It is a useful pink though, great for Caucasian skin tones, among other things. Anyway, on to the card! I used the partial die cutting technique to create the band across the middle of the Springtime Impressions Thinlit for the sentiment. I love how it creates one seamless piece for the front of the card. To get the band, I lightly drew two lines across the Whisper White cardstock to mark where I wanted the band. I then ran my sandwich through the Big Shot, with one end of the top plate lined up with one of the lines. The older style plates with the straight edges work best for this technique. I then repeated for the other line. I then used my trimmer and snips to cut along the two lines, but just to remove the excess cardstock, I didn't cut through the die cut design. Does that make sense? If not, google it - Jennifer McGuire has a great video tutorial. I finished the inside with a few of the coordinating flowers from the die set, adding a sequin to each centre to add a bit of glitz. This card will go to Ada's dance teacher, who is getting married in April. She likes her glitz! Time to pop on over to Catherine's blog, where you can find the links to the rest of this week's Colour Creations cards. 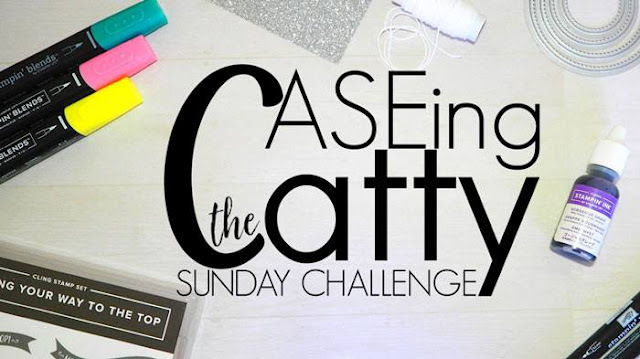 Welcome to the Sunday evening CASEing The Catty Blog Hop. The blog before mine was the lovely Monique's. Did you start there, here or somewhere else? Doesn't matter - just keep hopping until you get back to where you started. Tonight we are CASEing the Sale-A-Bration catalogues - that's right, there are two catalogues now! Did you know that the second release products are now available to customers? They are gorgeous! Mine did not arrive in time for tonight's card, so I have CASEd a colour combo from the new SAB brochure. The colours in this card really caught my eye - it's a masculine combo that is still quite light and fresh. I saw Balmy Blue, Night Of Navy, Smoky Slate, So Saffron, Whisper White and Silver Foil. To make my card I simply took strips of the four main colours and trimmed them to the same width as the card base. I used scraps of card, so none of them are the same height as any of the others. I like the random look - do you? I used some Silver Foil card for the sentiment. It adds a fun touch to the card, I think. The rest of the sentiment was from the new Itty Bitty Birthday stamp set. I simply trimmed the two words I wanted after I'd stamped the whole sentiment. For the inside I used the same cardstock to create the stripes, they are just half the height of the ones I used on the front. Do you decorate the insides of your cards? To me they don't look finished until I do! That's it for me tonight, you can join in the fun over at the Facebook group. 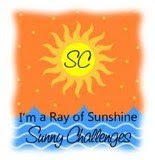 No need for anything fancy, just join the group and start uploading your cards for each challenge. For now, though, you're off to the lovely Shannon's blog, where she's got some wonderful SAB inspiration for you. 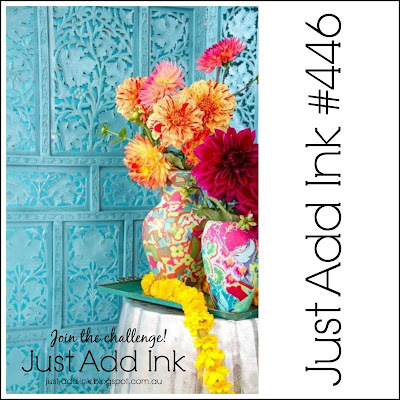 Hooray for the new challenge at Just Add Ink. This week Nikki has given us a colour combo with a little difference - we get to pick one of the colours! I really like this one! I was inspired by a top I purchased in Walmart in Orlando on my recent trip. It's a really sweet top - black with ruffles and lovely embroidered flowers all over it. Whoops, the tilt on the pic is a bit extreme, but you can see the top at least! 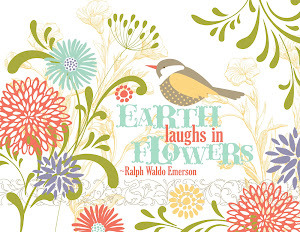 I loved the bold flowers on the black background, and used that as inspiration for my card. I started by using my Stained Glass Thinlits to create the window in the card. I backed the opening with a window sheet and then adhered the die cuts to the sheet. There wasn't really another way to do it. I had a scrap piece of Powder Pink cardstock that had already been embossed with the Subtle DTIEF, so I trimmed it and layered it underneath the window. The flowers were all punched using the new Bitty Blooms Punch pack. They were layered over a pair of Granny Apple Green (the colour I chose as my third!) vines, die cut from the Well Written Framelits. Some fo the flowers were popped up and others were adhered directly to the vines. I repeated the vines and flowers on the inside of the card, along with a strip of the Subtle Embossed Powder Pink cardstock I trimmed from the piece that went under the window. How do you like my clothing inspired card? Do you find yourself doing that? I see inspiration everywhere! 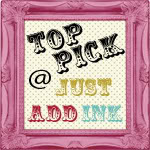 Why not pop on over to the Just Add Ink blog to see how the other Design team members were inspired by these colours? Which third colour will you choose? Welcome to another week's Colour Creations blog share, where we are looking at Pear Pizzazz. It's been a bit of a mixed up week for me, and nearly everything that could go wrong with this card has gone wrong! Oh well, I got there in the end! I haven't used my Detailed Floral Thinlits much, so I decided to pull them out for a play. I cut the top and bottom of some pear Pizzazz cardstock and then popped it up over a base of Night Of Navy. I love the dark colour peeping though. The stamping was all done using the Varied Vases stamp set and coordinating punch. You might notice that the punch only has a section for a tulip. 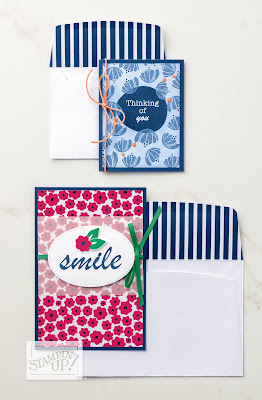 The Melon Mambo flowers were actually cropped using one of the flower punches from the Bitty Blooms Punch pack. It's not an exact match, but it's close enough! One of the things that went wrong was my camera battery dying as I needed to take the photos. I had to make do with my iPhone and lay the card on the carpet in my front (west facing) window. Thank goodness I'd vacuumed earlier! That's it for now, why not pop on over to Catherine's Blog, where you'll find the rest o this week's cards. It's a small group tonight, but I'm sure it will be big on inspiration! 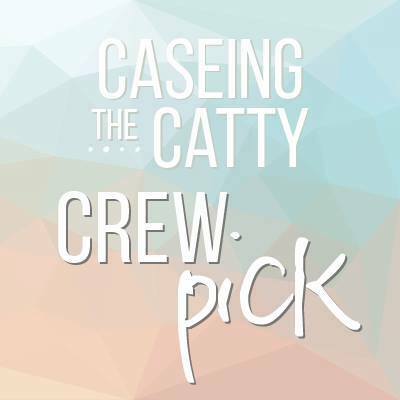 Time for the new CASEing The Catty blog hop! I do love these hops - don't you? 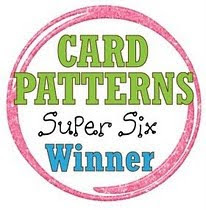 Hop, hop, hopping around in a circle until you get back to where you started, seeing lots of yummy Stampin' Up! inspiration as you go. What could be better? 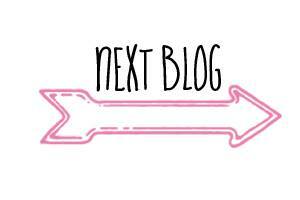 Did you come from the lovely Kelly's blog, or start here at mine? Doesn't matter, just keep on clicking! 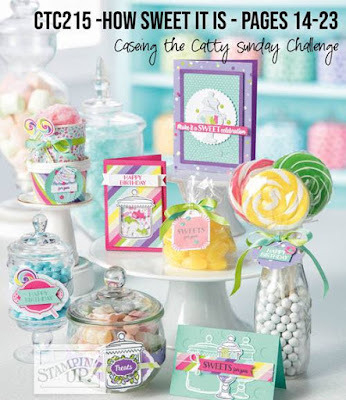 This week we are CASEing the projects from the How Sweet It Is section of the Occasions Catalogue, which runs from pages 14 to 23. Lots of pages in which to find a project, technique or idea to CASE. What will you choose? I didn't go any further than the first page of the section. I didn't CASE a card, this time I used a technique on several different cards. Have you noticed the Sweet Pins and Tags in the catalogue on page 15? What are you waiting for, they are sooo much fun! Look at the two front jars and the bag of yellow lollies. They come in three different shapes, each white with an iridescent border. Here comes the fun part - you can colour them! I pulled out my sponge brayer and went to town! I chose the medallion shaped tag and coloured it with Tranquil Tide ink using my sponge brayer. When I had the colour I wanted I took a piece of towel and wiped over the iridescent border to remove any excess ink. Then I was set to decorate! The tags on page 14 are layered with strips of ribbon, DSP and stamped images, so I did the same. The motorbike was fussy cut from a piece of the Classic Garage DSP and the birthday was cut from Black Foil using my Well Written Framelits. I have used them so much! The front was completed with a length of Flax ribbon, a piece of Smokey Slate DSP from the Neutrals pack, Basic Grey cardstock, cut with a Rectangle Stitched Framelit, and a Tranquil Tide base, embossed with the Subtle DTIEF. I used a scrap of the Classic Garage DSP to finish off the inside, which also includes a sentiment from the new Incredible Like You stamp set. That's it from me, next is the wonderful Rose Packer! 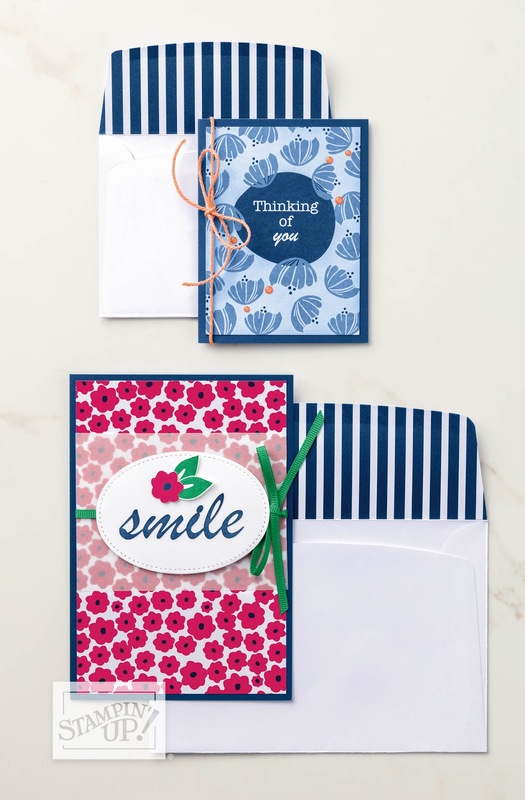 Don't forget to also check out our Facebook group, where you can add your card inspired by something in the How Sweet It Is Suite of the Occasions Catalogue.